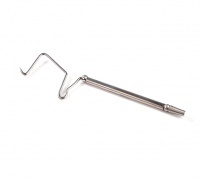 The Streamworks Whip Finish Tool is ergonomically designed for easier handling whilst finishing off flies. Its swivel tubed handle rotates smoothly, allowing for quick and easy tie-off of thread. Standard length suits most hook sizes.